Metal panels have come a long way in recent years and are no longer used for just roofing and siding. Create seamless lines with full accent walls or break up a wall with eye-catching wainscot. Using metal inside your home or office opens up a world of possibilities, so don't be afraid to get creative with metal panels. For a traditional rustic design, our bare metal products like Truten A606 or Bonderized are a popular choice. Truten A606 has a coated layer that rusts over time, while Bonderized will stay a classic matte gray. Galvanized or Galvlaume finishes are also becoming popular in rustic homes because of their authentic metallic finishes. 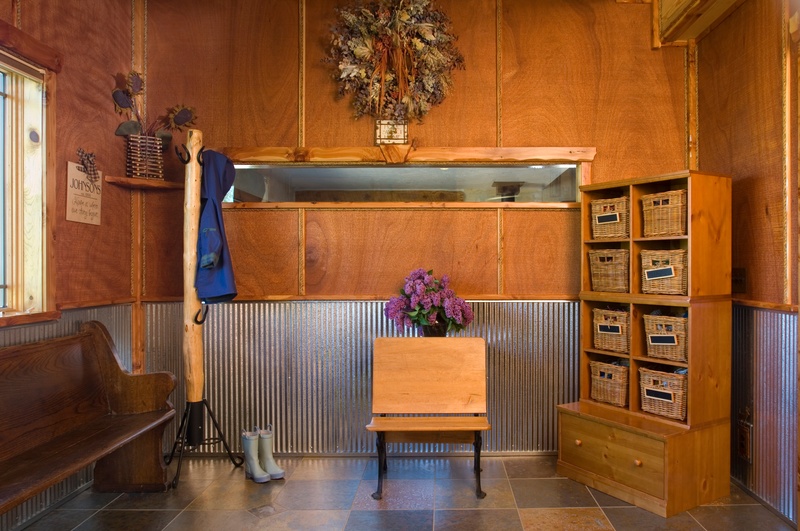 Creating a rustic look in the home or office often involves bringing corrugated panels into the interior of a build. Mixing interior rustic metal with different elements such as wood and stone can add visual depth to a space. Interior designers encourage mixing different materials to create contrasting, yet cohesive spaces. Using rustic interior corrugated panels against wood cabinets as kitchen backsplashes or full wall accents are great ways to add dimension to a space. In office spaces, rustic corrugated metal is often seen on front counters or desks for a one-of-a-kind accent. A common question we get when designing interior spaces is whether to use a wainscoting or not. What we can safely say is that interior wainscoting works well in some situations, and not so well in others. For larger spaces the general interior design consensus is to use a full wall accent, rather than breaking up sightlines in a room. Using interior metal as an accent wall can help create wonderful transitions between the different elements of a home. In rustic mountain or ranch style homes we have seen Galvanized or Galvalume 1/4" or 1/2" Corrugated metal to complement warm tones. A common trend is to mix interior metal wainscot with wood trim, floors, or accent walls. The warmth of the wood combined with the coldness of metal creates a well balanced space. Our most popular standing seam panel for interior projects is Ultra Batten. This panel was designed to mimic the traditional board and batten style, making it a great panel for interior wainscoting or kitchen and bar surrounds. The durability of the metal is also great for keeping your walls protected. As a flat panel, metal is a popular option as an alternative for a number of other materials commonly found in interior designs. One major reason for this is the recent desire to bring exteriors and interiors together in smooth transitions between areas. Instead of full stone fireplaces or tile backsplashes, designers and builders are using Truten A606 flat panels to add eye-catching accents in the home or office. Flat metal panels can be created as hidden fastener panels or with bold exposed fastener strips.